FRX2XLS converts Excel XLS files from FoxPro report (frx) format. It is easy to use. Just drag it on your form operated with Foxpro frx till now and start converting. It works with report variables, converts labels, fields, shapes, lines by keeping the original size and formatting. FRX title, pageheader, groups, pagefooter, summary sections can be converted to Excel. You get the full source code of FRX2XLS for this price! A nice progressbar class is also included. 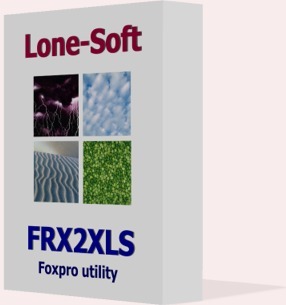 Download sample Foxpro frx and the converted XLS to make sure about its prominence. Download FRX2XLS user guide for further information. Download FRX2XLS demo (VFP 9.0). Download FRX2XLS demo (VFP 6.0). By downloading or using this Product, you agree to be bound by the terms of this agreement. You can pay with . After paying you will immediately get the product by e-mail. Converts Foxpro table to Excel (XLS). Can create group, formatable, very fast, uses Excel function to calculate. Your end-users will love it! You get the full source code. A nice progressbar class is also included. Get both usefull converter for SPECIAL PRICE!